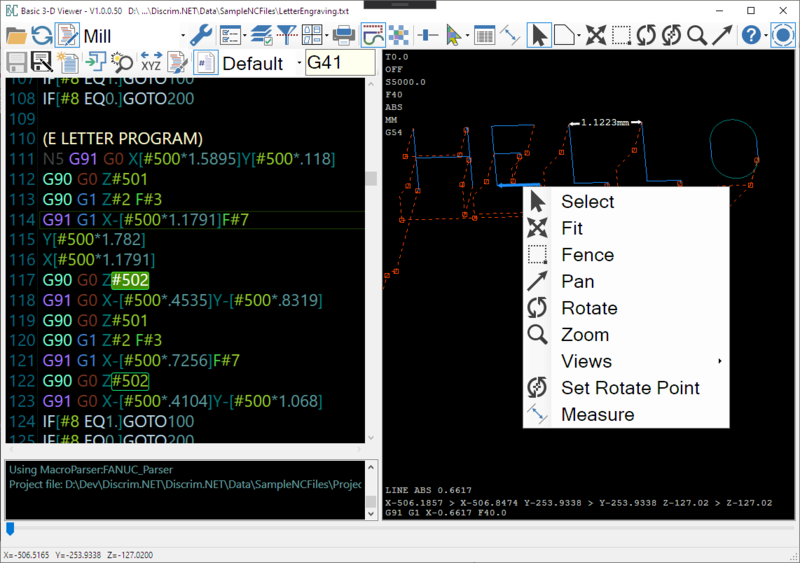 The Basic CNC Viewer is free. No license is required and it will never expire. This software must not be relied upon to validate an NC machine program for use in a commercial application. Please see the EULA for limit of liability and restrictions. Click here to download an installation package. Extract the zip file to a convenient location and run setup.exe. is a BETA release and should not be used in ANY production environment. Improved error handling in parser. Added viewports and display settings to stored settings. Allowed parser to be more tolerant. Fixed a problem with the settings dialog. Fixed a problem where sometimes an M-code was treated as a motion code. Added support for sub program repeats and drill repeats. Refesh will be triggered when the gcode modified time changes. Fixed a problem with the progress bar. Fixed a problem viewing small elements <.001 long. Removed Click Once deployment because too many people are having trouble with it. Added support for passing file argument on startup. Fixed a problem with rapid positioning. Fixed some problems with the code parser. Fixed a problem with EULA window and added information display. Fixed a problem where the last line in some files was not processed. Fixed a problem with Vista and Windows 7 where the program will not start. Fixed a problem where graphics are invisible when no tool is specified. Added integer option to machine precision. Improved comment character options to allow single character comment lines. so that the user may adjust the settings. Added setting to ignore whitespace while parsing. Added ClickOnce deploy and attempted to fix a localization problem. Fixed a tool color problem when creating a new file. Improved error handling for macro files. Fixed display units in the viewer. Fixed a problem when editor was not displayed. Recompiled to include all current fixes. Added setting to invert axees.